I learned something important about myself on the weekend. I am less patient with myself now and much less accepting of some of the things others in my society believe about life in organizations. I don’t expect to be seen as being any more “right” in my views now than in my earlier years. I don’t expect folks in general to agree with me any more than they did in the past – that is up to them. But I do find that I am not prepared to engage in as much dialogue about these beliefs with those who see things differently, unless that dialogue leads to real constructive action that benefits both of us. I have worked for a long time. Over the course of my career, I have kept up a constant involvement in academic life – as a night student, graduate student, part time lecturer and distance education participant. I have and still read widely in management and workplace psychology. I have thought hard about what I was doing at work and how I was leading the folks who worked for me. I have come to these four conclusions by reflecting on both the reading and the experience. I have quietly held them for years. They underlie all my consulting work and business related writing. 1. Performance appraisal is a waste of time if you are looking for business results. Our evolved instinctive approaches to living in tribes makes power based interpersonal relationships vey much part of the way that we work together. We like tribally defined hierarchies. We need leaders and followers. We need to know where we stand in these tribal power structures. Performance appraisal does a fine job of addressing these needs. But it does nothing at all to increase an organization’s ability to generate results. I have personally appraised dozens of direct reports. I have directed the building of innovative computer based performance appraisal systems. I have led the implementation of such performance appraisal systems in large large IT organizations (> 1500 professionals). But I now accept very little of my work around performance appraisal contributed to improving the results we delivered in the organizations for which I worked. I now know that backward looking performance appraisal simply does not justify the energy it takes to do and the anxiety and mistrust that it creates in the people who were appraised. and then getting together regularly to review delivered personal results against the agreed upon performance objectives. Managers who do performance contract in this way lead at work. They inspire. They shape the future through the actions of the people who work for them. It worked for me. I have twice created IT organizations that outside auditors independently judged to be “world class excellent”. In both organizations, I did performance contracting with my direct reports, and encouraged them to do so with the people who worked for them. Together, we supported the cascade of this approach down our organization. Performance contracting is not easy. The boss must make a personal commitment to simultaneously treating the people who work for the boss as problem solving peers and as results-responsible direct reports. Doing so involves accepting and working with the dynamic contradictions between these two roles. As power solving peers, the two people share power and a kind of equality. As direct report and boss, they are in a clearly defined power hierarchy. Recognizing and respecting these differences, and dealing with the conflict they create, takes self awareness and self containment on the part of the boss. Bosses must discipline themselves to continuously clarify when they are behaving as a problem solving peer and when they are behaving as a results evaluating superior. At times, bosses must negate the “power surge” that comes from being a results evaluating superior so they can effectively coach as a problem solving peer They must resist the temptation to use the power component of the relationship to simply dictate the solutions to problems when the two of them engage as problem solving peers. They must accept that simply telling does not always lead to understanding on the part of the direct report. They must act as if this is the boss’s failure, not the direct report’s, when this occurs. At other times, particularly at the end of the performance period, bosses must take on the tough challenge of carrying though on negative consequences when the direct report’s performance has been lacking. This is not easy if the boss has developed a “liking” for the person through working with the individual as a problem solving peer. It will be even harder if the boss has failed to coach effectively in the regular review meetings between the two. Human beings’ instinctive approach to managing performance in organizations – power based performance appraisal – is much easier, especially on bosses. It just does not motivate the folks who are appraised to produce “above every day” or excellent results. 2. Organizations waste the dollars they spend on interpersonal skill training (e.g. programs on leading others, resolving conflict …). If behavior on the job does not change as a result of training, the money spent on it is wasted. Very little interpersonal behavior training leads changes on the job, despite the millions of dollars spent on managerial, supervisory and interpersonal skills training. Every one “kind of” knows this. That is why there is so few systematic follow up programs to measure actual “on the job” behavior after such training programs. As long as we don’t have to face the facts, we can continue to believe. There are two reasons why behavior change back on the job after participating in interpersonal skill type of training program is so hard. 1. Unless individuals are personally motivated, they are not going to change their behavior back at work (or in their personal lives), even it they learn the underlying ideas and concepts. Self selection and self initiation of participation in such training is a good indicator of the needed motivation. Personally enrolling oneself in this type of course is a good predictor that the individual might have the needed motivation needed to actually change behavior back on the job. Expending personal resources to pay for the training is an even better one. Being “sent” on such program by your organization has very little to do with having the level of personal motivation needed to actually change behavior on the job. Yet many organizations ask people to attend such training programs because the “boss” thinks it is a good thing, or because it is the norm for all people who first enter a certain job level, or because some executive has come to believe that this type of training has pay back. 2. Individuals behave in interlocked patterns at work. If one person changes his or her interpersonal behavior, the others the person interacts with have to change theirs as well. These other people are often not motivated to do so. Instead, they put group peer pressure on the person who changes his or her behavior after attending a training program to revert back to the old behaviors the person had before they went on the training program – the social extinction effect. Most individuals who try to implement new behaviors do revert back to the old behaviors in the face of this implicit social pressure. The training investment is lost. The individuals who persist in wanting to change their behavior after such training often respond to the peer pressure by finding new people to work with. Usually, this means moving to a new job. Often, that new job is with another employer. The training investment is lost. Organizations who want to really change interpersonal behavior patterns need to engage in systematic culture change programs. As well as training, such programs involve visible recognition and compensation programs that reward the “new behavior”. These programs also involve specific activities that counter “resistance” to change on the part of current members of the culture. Such programs are difficult to plan and to execute. They must work from the top down and the bottom up in a coordinated way. They are intensely resource demanding. They require persistence over extended periods of time. Few organizations succeed at such culture change programs at the level of “walk”. Most organizations though engage in “talk” as if they are doing such things, even if they don’t really do them. There are a couple of simple things to consider as a result of these dynamics. If you invest in an individual’s interpersonal behavior change, you need to move them into a new job to have a reasonable chance of recouping on your investment. When individuals are motivated to spend personal resources on changing their interpersonal behavior at work, they are also at high risk for leaving your organization in order to find another job where they can practice those new skills. 3. Interview based recruiting is all about “good enough” hiring, not future performance excellence on the job. The academic research is clear – talk during recruiting interviews is not correlated with eventual final candidate performance on the job. But everybody continues to do to use talk based interviewing as their primary recruiting tool. Why? Talk based interviewing finds “good enough” candidates – both on the technical skill level and culture fit level. Talk based interviewing does not systematically succeed in finding the “best candidates”. It does not need to. Good enough is good enough for most organizations. Few organizations are really excellent. Most organizations talk ‘excellence”, even when they don’t “walk” it. It is possible to recruit for excellence. It takes “show us how you will perform with the people that you will be working with” recruiting techniques. This means crafting work based role plays and work based simulations. They are more difficult to set up and to facilitate than interviews. Creating them, and then facilitating them, is far beyond the skill of most recruiting professionals. The best way to see how a person will behave in the future – on the job, is to get them to behave currently. Get candidates to do, not talk about what they have done. Even “behavior based interviewing” does not do that. Job based role plays and work simulations go some way to allowing the assessment of performance fit. Involving future peers in interacting with candidates and then systematically collecting their impression of fit allows some level of assessment of cultural fit. The best hires – excellent performance fit to a particular job and superb emotional fit to a specific organization’s culture – are often temporary folks who have already “demonstrated” how they will perform on the job. You see what they can do and how they will interact with their fellow co-workers during their temporary assignment. The best predictor of future behavior is always past behavior. Bringing the person in on a temporary basis is the best way to assess both performance fit and culture fit. It remains the best hiring tactic if you are hiring for excellence. If you are not, and most organizations do hire for good enough, then the talk that happens in recruiting interviews will do. 4. Many human abilities are as much instinctive as thoughtful. Excellence at work requires thought rather than just responding instinctively. More and more, modern research is showing how much of our human capability to do and to interact with others utilizes ability systems that located in the pre-conscious parts of our brains. These evolved ability systems let us become the dominant species on the planet hundreds of thousands of years ago. Somewhere in the past 40,000 years or so, we began to move from being tribal creatures to being societal ones. We started to live in conglomerations of individuals which were bigger than one tribe. Previously, as simple tribal members, we might have had occasional interactions with members of a number of other geographically local tribes. But as societal creatures, we developed (i.e. added) the ability to be concurrent members of a number of tribe-like social collections that exist within our societies. As societal creatures, we developed organizations that specialized in achieving at least some of the objectives of each of their members. We shaped these organizations in which that reflected our evolution as tribal beings. Our organizations have hierarchies and insider/outsider dynamics that we developed as tribal creatures. At the same time, as societal creatures, we developed shared mechanisms and processes for collaborating within and across these organizations. Organizations traded with other organizations for the resources needed to achieve those objectives of each organization’s members. Thoughtful, structured, planned ways of interacting with individuals in these other organizations became as important a part of our human abilities as our instinctive ways of interacting with other individuals in families and in tribes. Today, we have all these types of ability. Our gene based evolutionary history adds new abilities to our competency repertoires. It does replace the ones we already have with new ones. Neither does evolution act to integrate new abilities with old ones in balanced way. As a species, we have simply added the new more thought based organizational abilities to our older instinctive interpersonal familial and tribal ones. Stress is a large of our organizational and societal life. Under stress, we tend to fall back on our instinctive abilities, even when they might not be as effective for dealing with a given situation as our thoughtful abilities. Our instinctive abilities often define our business and societal interactions. Much confusion and turbulence occurs in organizations and in societies as a result. Understanding and mitigating the results of these dynamics requires that managers in organizations consciously override their instinctive first responses with careful, thoughtful, analytically-based responses. The next generation of organizational behavior writing and business professional development curriculum needs to be much more clearly explicit about the evolutionary nature of human abilities. We need to move from theories of “emotional intelligence” to ones that more clearly reflect the additive evolution of our abilities. We need to make sure that managers understand that they concurrently have instinctive interpersonal and thoughtful organizational abilities. We need to help them recognize that our instinctive abilities, the ones we all move to under most levels of stress, are not the best ones to use to respond to the demands of organizational and societal life. There is tremendous hope for us as human beings. Our evolution has given us the ability to shape our collection future through collaborative, thoughtful organizational action. But we often do not. Our evolution has also given us the capacity to interact in ways that are firmly embedded in the pre-conscious instinctive abilities that evolved when we were members of families living in tribes. We need to move beyond the familial and tribal in organizational and societal life in order to have a future of hope, not one of self defeating strife. The HR and business press is full of articles about how Generation X, Generation Y and the next Generation now entering the work force are different from the Baby Boomers ware about to retire. But in one way they are not so different. Employee satisfaction surveys still tell us, like they have for the past forty years, that employees do not believe that performance appraisal helps them improve their performance. So why are we as managers not listening? There are a variety of reasons. Some have to do with organizational inertia. Some have to do with the fact that managers appreciate the re-enforcement of the relative power positions inherent in performance appraisal. But most importantly, we, as managers, really haven’t had the business support systems that we need to move from performance appraisal performance to performance contracting. Contracting for performance with our direct reports requires that we commit to the regular independent delivery of feedback to them. That feedback has to be based on agreed upon metrics. Those metrics, in the majority of cases, need to be tied to the automated business applications that we now use to run our business. So the business tools that we need are finally there. Now all we need to do is change our attitudes. We need to stop appraising people. We need to stop telling them what they did and did not do in the past. We need to stop rating them on a scale that invariably involves subjective judgment. We need to move to contracting about the future with these individuals. We need to help them get crystal clear on what it is they are expected to do. We tell them exactly how we will evaluate whether or not they accomplish the things they contract to do. And finally, we need to make sure that they get the data on these metrics directly from the automated business applications that we both use to do our work. That’s the essence of performance contracting for excellence. It is also the basis of effective boss – direct report coaching. Together, these two are the key to engaging people in the workplace. That engagement is, and will be ever more crucial, in the current and coming competition for skills and talent. Let us as managers demonstrate to the people who work for us that we can do what we expect them to do: listen to feedback. Let us take what we’ve been hearing on employee satisfaction survey after employee satisfaction survey seriously. Let’s start shaping the future, and stop appraising the past. Commit yourself to performance contracting with your direct reports. Here are some links that will help you accomplish this. Both are short voice over presentations that run in a browser over the Internet. How do you use performance contracting to pick “good”, rather than “bad” organizational leaders? “Why Are We Bad At Picking Good Leaders” is 5th on Harvey Schachter’s Toronto Globe and Mail Ten Best Business books of 2011. In it, Jeffrey Cohn and Jay Moran present the 7 characteristics that they correlate with good leaders. These qualities have been praised by many other “leadership” writers over the years. Cohen and Moran tell organizations to select for organizational leaders who demonstrate these qualities. They provide “stories” which illustrate how they believe that organizations can do so. But all of this advice may be missing an essential point. Finding a person who is exceptional on these 7 qualities may be a next to impossible task for most organizations. Suppose that a “good” leader needs to demonstrate possession of all 7 qualities at a level that is at least 2 standard deviations above average. Simple math will shows that the likelihood of finding, i.e. selecting, such a person is very slight. 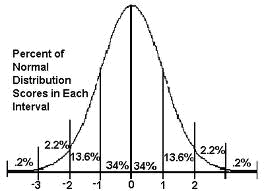 The normal distribution graph shows that only 2.4% (=2.2% + .2%) of the population will be 2 standard deviations above average when you consider 1 characteristic. If you expect an individual to be 2 standard deviations above average on 7 qualities, you have to multiply 2.4% by itself 7 times. If you do this on your calculator or in Excel, you will get a very small number indeed. 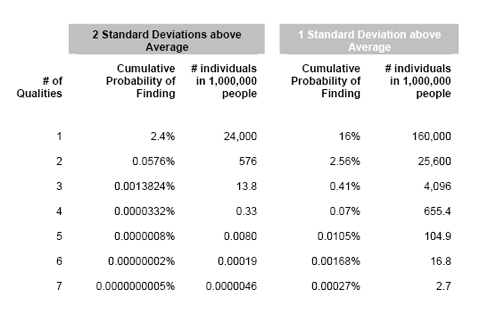 The following table shows the probability of finding a person who is 2 standard deviations above average on a progressively greater number of qualities. As you can see as you want people to have such outstanding levels on more and more qualities, the less likely you are to find them. Let’s make it easier. Say that a good leader only needs to demonstrate these 7 qualities at a level that is 1 standard deviation above average. Even in this case, the chances of finding individuals who demonstrate most or all 7 of these qualities at this above average level are still pretty slim (2.7 people in each 1,000,000). But we need to move beyond statistics. Cohn and Moran’s 7 qualities are not “simple” human behaviors. They are human characteristics that depend on a complex interactive mix of genetics, up-bringing, experience and education. This is the reason why years of time and millions of dollars of organizational investment in “leadership” training and development have not really produced an abundance of “effective leaders” who posses these 7 qualities at these levels. Does this mean that most organizations might as well forget the process of “finding” or “developing” good leaders? I don’t believe so. What can an organization do find and to develop better leaders? Organizations certainly need the succession planning processes that Cohn and Moran advocate. But organizations need to be base their decisions about individuals in such succession planning processes on an underlying performance management process that is strongly based on forward-looking, metric-based performance contracting. An individual who consistently achieves or betters metric based performance targets over a number of years, in a variety of executive positions, is a potential future organizational leader. That person is demonstrating that she or he can apply the “right” personal characteristics to stand out from the average performer in “this” organization. Useful leadership is always demonstrated in the context of an organization’s shifting specific economic, technological, social and cultural conditions over a number of years. The abstract “leadership characteristic” labels used by Cohn and Moran, and many other writers on leadership, tend to ignore this. Executive search consultants and academic writers turn “leadership” into an abstraction precisely because they are removed from the day-to-day performance of people in their client organizations. They do not have to deal with leadership as a concrete set of behaviours demonstrated by a specific individual that lead to valued results in a specific organization as over a significant period of time. Executive search consultants perpetuate this tendency to relate “leading” to these kinds of highly abstract personal characteristics. It is a core assumption necessary to the continuation of their business. Unless clients believe that leadership is “transferable” from one organization to another, retained executive search for leaders from outside an organization makes no business sense. If we approach “leading” in a less abstract way, and focus more on demonstrated “in context” performance, organizations are more likely to succeed at picking “good” leaders. Organizations that seriously want to “pick and develop” the leaders they need for the future will do the following. 1. Organizations will take care to develop their internal performance contracting competencies. They will use forward-looking performance contracts. These contracts will include a process by which boss and subordinate contract to use metrics to track subordinate progress. These metrics will derive from the automated business applications the organization uses to track and to manage the work done on a day-to-day basis. Once such a forward looking contract is “signed” by both boss and subordinate, these metrics will be delivered independently to both boss and subordinator over the course of the performance period. As a result, the power relationship between them will shift. Bosses are more likely to become coaches when subordinate performance goes off-track. Subordinates are more likely to “ask” for help when they see that they are under achieving. This performance contracting and progress monitoring process will be in place for at least the “manager of others” levels and above in the organization. 2. The senior most executives in such organizations will systematically review actual performance on such performance contracts to identify top performers: – individuals who consistently achieve and deliver at or beyond their contracted performance metrics. 3. These organizations will promote such top performing individuals so that over the years their job scope becomes more complex and wide ranging. As a result, maintaining “top performance” status will become harder and harder over time. This will refine the identification of potential leaders based on actual performance, not personal loyalty or personality fit between boss and subordinate. 4. These organizations will “move” such top performing individuals to a variety of assignments over the course of their career. This will allow the organization to see if their ability to deliver at or beyond contracted performance levels remains consistent in a variety of organization environments (functional, operational and geographic). ”Picking good leaders” in this way will take commitment over a number of years. The performance contracts for the CEO and the CEO’s immediate reports will consistently require the presence of metrics that “show” that this is being well done. Organizations that do this will not be “bad” at picking good leaders. Instead, they will be shaping their futures in way that increase their probability of long lasting competitive success over a number of executive generations. Are you, like thousands of managers, dreading the performance appraisals that you need to do at the end of every year? You are not alone. Just about every survey of working professionals that asks questions about performance appraisal document the discontent that people feel with the performance appraisal process. So how do you make this better? How do you avoid the year end performance appraisal blues? Simple, really. Make a resolution to move from performance appraisal to performance contracting in 2012. Here’s how to do it in seven easy steps. 1. Start by making a list of each of the people for work for you. Then for each one, brainstorm the things that they do for you. Use the outline facility in Word or a software tool like Inspiration or paper and pencil, whatever works for you. 2. Once you have an initial list, re-organize it until you have between 3 and 7 main responsibilities for each person. It’s hard to work with more. if your list is longer, group things together until you have the 3 to 7 you need. 3. Now imagine that this person is going to do a great job on each of these 3 to 7 items throughout 2012. Visualize this. Run an internal film or set of pictures if that works for you. Ask yourself the following questions about each of the 3 to 7 responsibilities. Use the following script to help you do this. ◦ Seeing – what’s showing me that … (the person’s name) … is doing a great at this? 4. Translate what you are imagining – seeing and hearing – into a single statement – a measure or metric that lets you and others know that this person is doing a great job at this item. Ask yourself the following question as you do this. That adds an important time dimension. The shorter, the better. Keep then under a quarter. 5. Organize your results into a single page. List the 5 to 7 responsibilities. Put the appropriate measure or metric below each one. 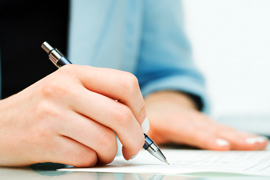 Title the page “Draft performance contract for … the person’s name.” Make two copies. 6. Now you are ready to have a meeting with the person. Give the person a copy of the draft performance contract. Work through it together. See if the individual is clear about each item and each measure. Listen to any issues the individual has about any item. If these concerns help clarify things and make the measures even more concrete and specific, modify the page to reflect these concerns. 7. When the two of you are through, you negotiated a straight forward performance contract between you. Turn the modified draft into a final version. Make two copies of it. Each of you sign both copies, and then take one for yourself. Doing so finalizes the contracting process between you. Only 1 more thing to do and you are on your way a hassle free performance appraisal at year end. There, you have stopped performance appraising and become a performance contractor. Instead of looking back and evaluating, you are looking ahead and coaching. You will find that your folks appreciate knowing what they have to and how it will be measured. They will probably surprise you by exceeding some of the measures. If performance problems do occur, then the two of you have become collaborative problems solvers. Together, you will focus on fixing performance problems as they occur, not evaluating them after the fact.